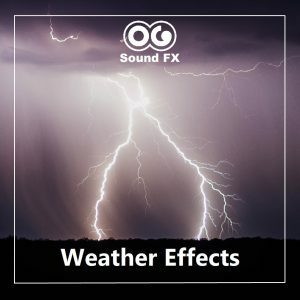 weather effects | OG SoundFX - High Definition Sound FX & Ambient Loops. 1 - 20 out of 26. You are browsing 1020406080 per page. 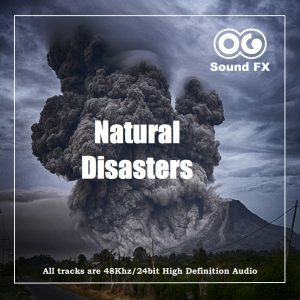 High definition 48kHz sound effects and ambient loops of winds, storms, rain, lightning, tornadoes, hurricanes and more for your indie video game or other project. Totals 41 minutes with over 680 Mb of high-quality sound effects. All files stereo 24-bit 48kHz WAV format. A heavy thunder storm with frequent lightning strikes all around and pouring rain, you are in the middle of it. Browse our Album section for great deals: SFX Packs All tracks are High Quality 48Khz/24 bit WAV files. This is the sound of a very strong wind. The kind of winds that can turn cars, tear house roofs apart and uproot large trees. This track could illustrate a hurricane, a strong gale at see or North Pole winds that can reach up to 200 km/h in an icy cold environment. Browse our Album section for great deals: SFX Packs All tracks are High Quality 48Khz/24 bit WAV files. A heavy thunder storm with frequent lightning strikes all around, you are in the middle of it. Browse our Album section for great deals: SFX Packs All tracks are High Quality 48Khz/24 bit WAV files. A huge natural waterfall that can be found in different environments: Forest, jungle, plain or in the Mountains. Browse our Album section for great deals: SFX Packs All tracks are High Quality 48Khz/24 bit WAV files. Heavy rain pouring on concrete surface. It is a loop so you can put the track in a row as long as necessary. This can be used in many ways. Either as background, or in addition to other sounds like wind and thunder to create a stormy atmosphere. Browse our Album section for great deals: SFX Packs All tracks are High Quality 48Khz/24 bit WAV files. This sound effect track is rain pouring on concrete surface. It is a loop so you can put the track in a row as long as necessary. Perfect to replace an unsatisfactory or non existing background recording. It is a loop so you can put the track in a row as long as necessary. You can find this track in the Weather Effects Album which includes over 680 MB of weather sound effects for only $19 ! Feel free to browse the Album section for more great deals: SFX Packs All tracks are High Quality 48Khz/24 bit WAV files. This sound effect track is rain pouring on Leafy surface. It is a loop so you can put the track in a row as long as necessary. Perfect to replace an unsatisfactory or non existing background recording. It is a loop so you can put the track in a row as long as necessary. You can find this track in the Weather Effects Album which includes over 680 MB of weather sound effects for only $19 ! Feel free to browse the Album section for more great deals: SFX Packs All tracks are High Quality 48Khz/24 bit WAV files. This is a short gust of hail, where we can hear the sounds of the small ice balls hitting on the tin roof and the ground. Could also be used for strong rain. You can find this track in the Weather Effects Album which includes over 680 MB of weather sound effects for only $19 ! Feel free to browse the Album section for more great deals: SFX Packs All tracks are High Quality 48Khz/24 bit WAV files. Single thunder strike. Perfect for films and documentaries when the on set recording is not satisfactory or non-existing. You can find this track in the Weather Effects Album which includes over 680 MB of weather sound effects for only $19 ! Feel free to browse the Album section for more great deals: SFX Packs All tracks are High Quality 48Khz/24 bit WAV files. A heavy thunder storm with frequent lightning strikes all around, you are in the middle of it. 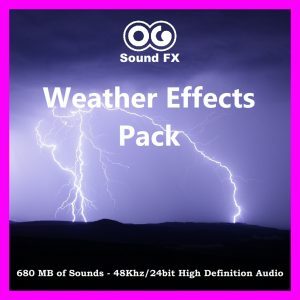 There is no rain on this sound effect, but if you are looking for a similar effect with rain pouring, you can find this track in the Weather Effects Album which includes over 680 MB of weather sound effects for only $19 ! Feel free to browse the Album section for more great deals: SFX Packs All tracks are High Quality 48Khz/24 bit WAV files.